We caught up with naturalist and best-selling author, Sy Montgomery, to find out what most humans don’t understand about animal intelligence. The New York Times called her ‘equal parts poet and scientist’. The Boston Globe claims she’s ‘part Indiana Jones and part Emily Dickinson’. However you choose to describe Sy Montgomery, one thing is clear: this is a woman dedicated to her work. 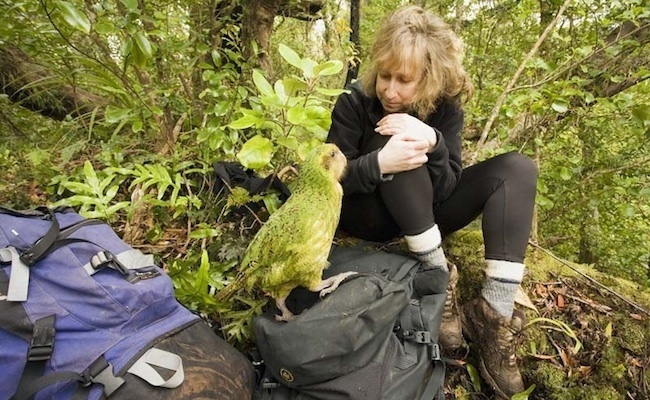 She’s been chased by an angry mountain gorilla, bitten by a vampire bat and undressed by an orangutan, all in an effort to better understand the many creatures we share our planet with. A champion for animals in the truest sense, Sy has written extensively on a subject that’s clearly very close to her heart. While best known for The Good Good Pig, the story of a runt piglet who grew into a 750-pound Buddha master, her other books are equally compelling. In The Soul of an Octopus Sy explores the emotional and physical world of a surprisingly complex, intelligent, and spirited creature—and the remarkable connections it makes with humans. In her latest book, Tamed and Untamed: Close Encounters of the Animal Kind, Sy and her best friend Elizabeth Marshall Thomas share an engaging collection of essays that offer extraordinary insights into the minds, lives, and mysteries of animals. The evolution of animal intelligence has long been a subject of fascination for humans and yet somehow we still struggle to understand animal emotions. In her 2014 TEDx talk: Do Animals Think and Feel, Montgomery takes us on a heartfelt adventure to present the overwhelming evidence that animals across a wide variety of species do in fact think and feel and experience consciousness. We caught up with her to find out more. What is the one thing you’d like humans to understand most about animal intelligence? (If it’s even possible to distill it down to just one). We are now learning that there are, even within our own species, different types as well as degrees of intelligence —and this is the case for other species and among individuals of other species as well. As with evaluating the intelligence of fellow humans, we should not underestimate the intelligence of other species. If we do so, we overlook something wondrous and transformative, and we underestimate the glory of the world. How do you respond to naysayers who don’t believe animals can be sentient beings? Specifically when it comes to sea animals? For some reason people can’t seem to view fish as thinking, feeling, intelligent beings. How can we change that way of thinking without being pushy or judgmental? I wish I could take a naysayer to New England Aquarium to meet one of the giant Pacific octopuses there. When you watch an octopus look into your face, flush with emotion, rush over to your side of the tank, and extend his or her arms out of the water to greet you, then you plainly see an individual who thinks and feels and knows. What can you tell us about Athena that would move the average person’s viewpoint of her from calamari to highly intelligent sentient being? Experiments have shown that octopuses recognize individual human faces simply by looking up at them through the water. 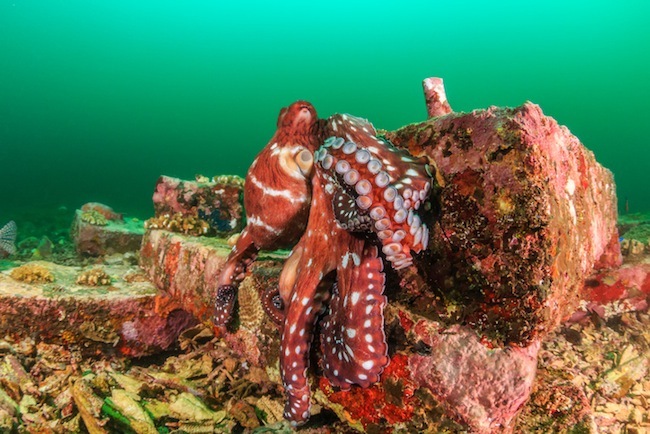 Octopuses love to play with the same toys our children do (Legos; Mr. Potato Head, for instance.) They have distinctive personalities (leading their keepers to name them accordingly; Athena, a feisty octopus, was named after the Greek goddess of wisdom and war) and some appear to have a sense of humor! What are your thoughts on aquariums? While obviously valuable as a way for us to learn more about the ocean’s many inhabitants, is it right that we pluck these creatures from their real home and relegate them to a life of captivity? I’m glad you asked that question. Do we have the right to seize animals from the wild to put them in captivity for our edification and amusement? I do not think this is a God-given right at all. BUT, given that we live in a society that considers killing and eating animals a perfectly moral thing to do, keeping animals in captivity CERTAINLY does more good than harm —not only to species but also to individuals. One statistic I read is 450-1000 billion fishes (this does not include shellfish, octopus, or other sea creatures) are caught from the wild each year to be killed and eaten by humans (even more are killed for fertilizer and to feed other animals we raise for food). But even that huge number of deaths is dwarfed by the number of fishes who suffer, die, and face extinction of their kind due to the MUCH worse, and far thornier problem of pollution, which includes human-caused climate change. To take octopus as one example: a female octopus lays 100,000 eggs, only once in her life. All but two of them will die, before sexual maturity, torn limb from limb and be eaten —by other sea creatures or by humans. The one who survives long enough to lay her own eggs has won the lottery! But in second place is the lucky octopus who lives in a spacious aquarium with interesting things to do, good food and proper attention. And all the while that octopus has an opportunity to educate aquarium visitors about the wonders of the sea —at a crucial time when we desperately need their example to inspire people to care for the oceans and all its creatures. Can Humans Understand When Animals Are in Distress? All animals are thoughtful and emotionally rich beings. Some animals are much smarter than some stupid humans! Thanks!